Aisle50 raised a total of $6 million, including funding from August Capital, Y Combinator and Origin Ventures, and was acquired by Groupon in 2015. ZRankings ranks the best 220 ski resorts in North America. Its algorithms power the best-read ski resort profiles and rankings on web, including those at Forbes, FreeSkier magazine and Realty Trac. Its rankings have appeared on Fox News and CNBC. 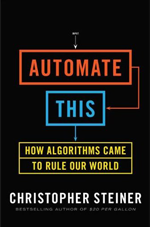 My second book, Automate This, was published by Penguin in 2012. Well reviewed by the Financial Times, the Wall Street Journal, MIT Technology Review and an erstwhile news program known as The Colbert Report. Buy it at Amazon. I make regular contributions at Forbes, while also writing for outlets like the Wall Street Journal, Fast Company, The Guardian of London and others. Christopher Steiner is a founder, engineer, New York Times Bestselling Author, dad, husband and skier.